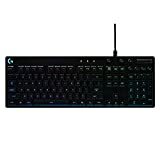 The Logitech G810 Orion Spectrum is a mechanical keyboard that targets gamers and is focused on delivering performance. Logitech Vice President Ujesh Desai said, they met with dozens of gamers and asked them, what they wanted in a gaming keyboard. The result is the Logitech G810 Orion Spectrum. The Logitech G810 features Romer-G Switches. These switches were first used in the Logitech G910 – they are fast mechanical switches designed for high performance gaming. The keyboard features 26-Key Rollover, which is certainly more than enough, even for the fastest gamers. The keyboard supports full RGB lighting, meaning you can choose from a spectrum of over 16.8 million colors. The Logitech Gaming Software comes pre-loaded with lighting profiles for over 300 games and there are many possibilities to customize it. The Logitech G810 Orion Spectrum has several dedicated media controls to adjust the volume and control the playback of audio and video. How is the G810 Orion Spectrum compared to the G910 Orion Spark? Both are mechanical gaming keyboards with customizable RGB lighting, dedicated media controls and Romer-G Switches. The labeling and the shape of the keycaps is quite different though. The G910 has a typical gaming keyboard look, while the G810 makes a more serious impression. Furthermore, the G910 Orion Spark offers more extras than the G810 Orion Spectrum does. Some of them have been cut in the G810 to achieve a more straightforward design. The G810 is missing dedicated macro keys, has no palm rest and no possibility to connect your smartphone to the keyboard. The mechanical keyboard score is our overall score for a keyboard. The score is based on the available ratings and critics and makes an easy comparison between different mechanical keyboards possible. It is also used for our mechanical keyboard ranking. "Logitech's G810 Orion Spectrum is a low-key, high-quality, customizable gaming keyboard that's better suited to occasional players than serious gamers." "The pricey Logitech G810 lets its Romer-G switches shine, while adopting utilitarian style and omitting Logitech's G-key macros." "The G810 Orion Spectrum boasts fine media controls, slick lighting, and superb software. Only its lack of a few features we’d expect at its price point keep it from a top recommendation." 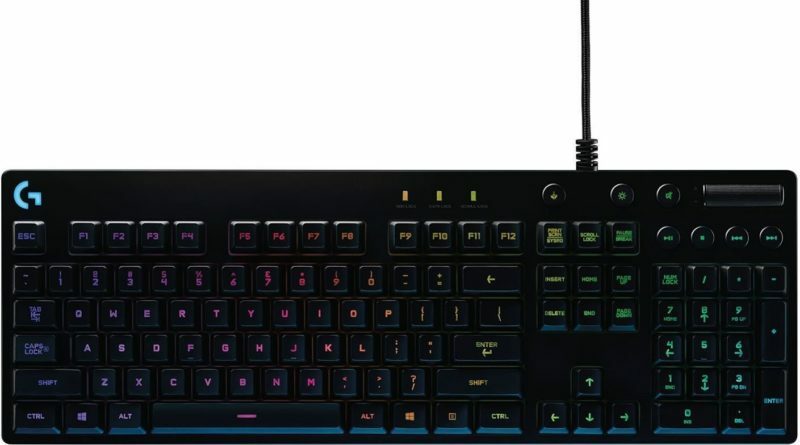 "The Logitech G810 Orion Spectrum is a gorgeously designed keyboard that sports solid mechanical keys, great software and full RGB illumination. It's worth the premium for discerning PC gamers." "Hochwertig verarbeitete, sehr präzise und leichtgängige mechanische Tastatur mit kontraststarker, flexibler RGB-Beleuchtung und intuitiven Multimedia-Tasten." View Keyboard Reviews for the full list. Mechanical-Keyboard.org was created with the goal, to offer the most comprehensive list of mechanical keyboards in the web. For an easy comparison, a ranking is calculated based on collected reviews and opinions from tech experts. Additionally, there are various guides to answer frequently asked questions about mechanical keyboards. Copyright © 2019 Mechanical-Keyboard.org. All rights reserved.Theme: ColorMag by ThemeGrill. Powered by WordPress.